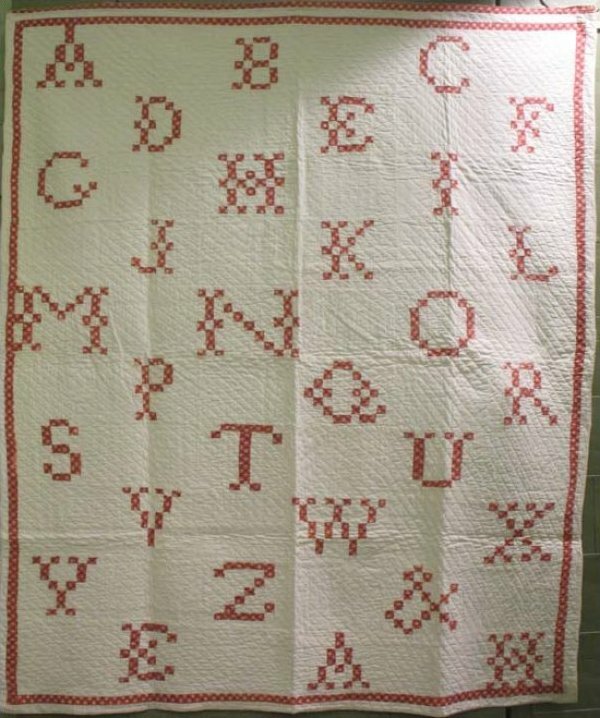 A most unusual Alphabet quilt that looks like a needlework sampler thanks to the 1" postage stamp squares used to create the letters. Cross-stitch-looking lettering like this appears in some early 19th century quilts with words and names, check the sites at Historic Deerfield and other museums. This is the first one I have seen come to market. Most alphabet quilts have solid bold letters cut out using heavy paper stencils. The delicacy of this treatment speaks for itself. The letters here resemble the cross stitch monograms on early homespun linens. All letters and the border are pieced of the same early 20th century red and white print. Initials of maker or recipient are at the lower right. The difference in scale of the letters is charming too.